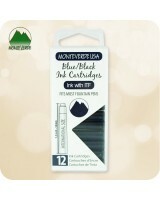 These Fountain Pen Ink Cartridges fit many Fountain Pen Brands that use the international short size ink cartridge such as Montblanc or Pelikan. You may search for short fountain pen ink cartridges, International Standard cartridges or you can narrow down your search to a specific pen brand or style, by using the Quick Product Finder Menu above. Contact me and I will try to help you locate the refill you are looking for! Shipping from Canada, worldwide!